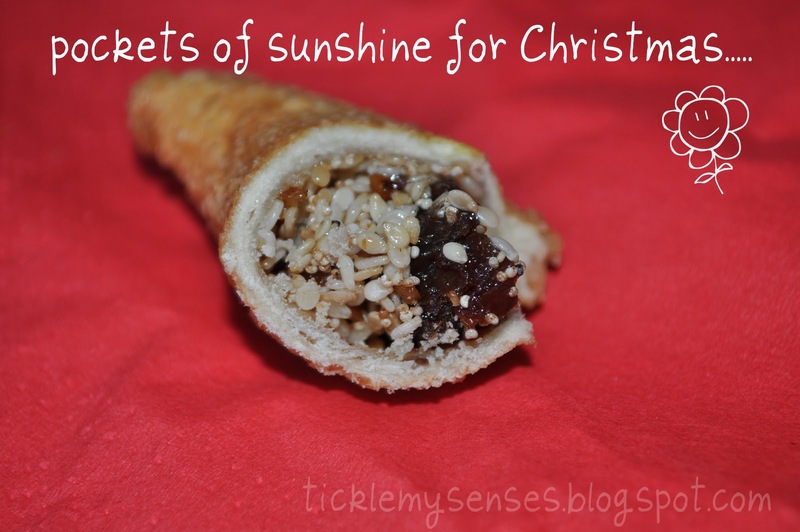 Tickle My Senses: Sweet Date and Walnut Crescents/ Nevryo/ Nevrio, Karanji, Kajjayakalu for Christmas. 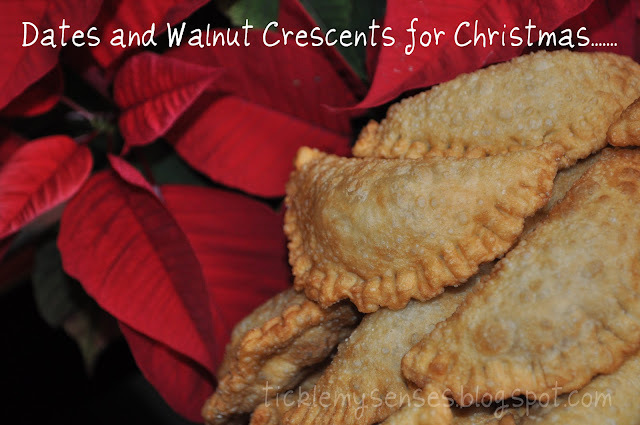 Sweet Date and Walnut Crescents/ Nevryo/ Nevrio, Karanji, Kajjayakalu for Christmas. 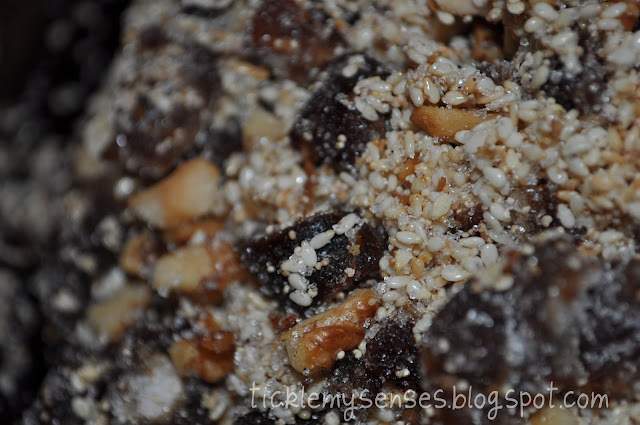 I am almost coming to the end of my Kuswar/Christmas sweet making journey for this year. It is Christmas in less than 10 days and my cupboard is stocked with Special Karakadde or Chilli and Ginger flavoured Spicy Gramflour sticks, Rosette Cookies/ Roce Cookies/ Kokkisan, Sweet Semolina Balls with Almonds, Raisins and Condensed milk/Rava Laddus, Butter Chakkuli's/ Crispy Savoury Flour wheels, not forgetting the Caribbean Fruit Cake and now Sweet Date and Walnut Crescents/Nevryo/Nevrio. I am so looking forward to sharing these treats with friends. If you, like me, enjoy in things out of the ordinary..... a little bit of adventure....give these nevrio's a go!.... ..
1. 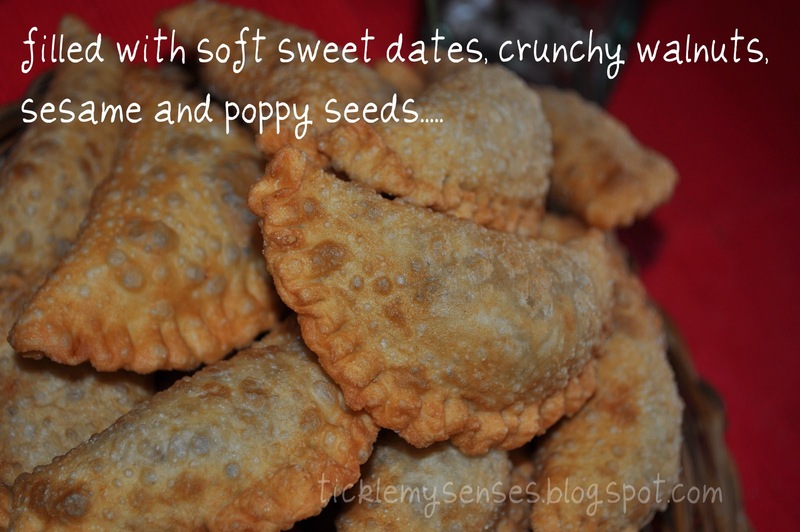 In a pan on medium heat, roast seperately the sesame seeds till lightly browned, keep aside, roast the poppy seeds till they start popping, keep aside. 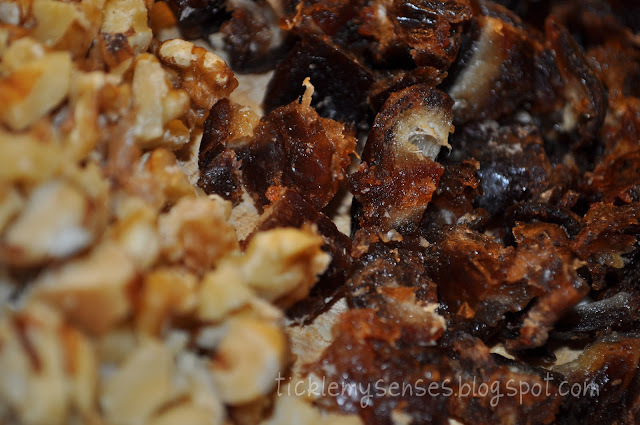 Roast the nuts till fragnant, then add the roasted seeds and cardamom powder, dates and sugar to the pan. Before the sugar starts melting take the pan off the heat and mix all the filling ingredients together. Set aside. Should be completely cool before filling. Make previous day if possible. 2. Place the flour in a bowl, add salt to it. 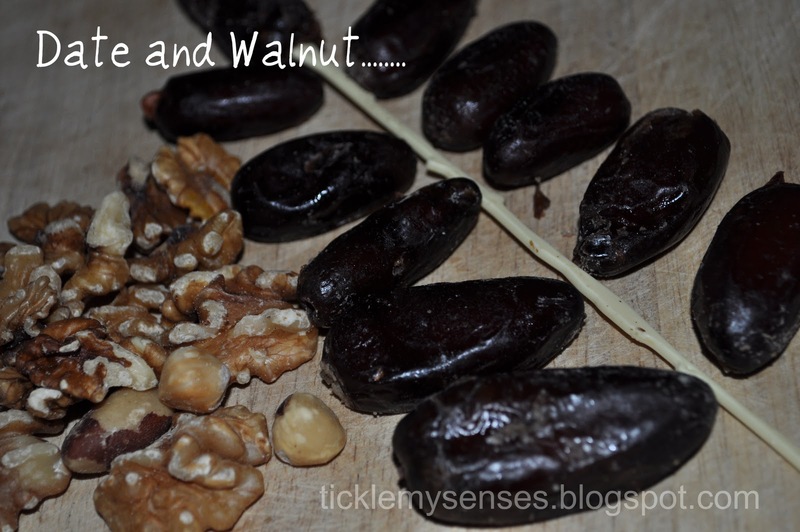 Mix well with fingers. Melt oil/ghee in a pan till really hot and then pour the hot oil into the flour and mix well with a spoon. Then using your finger tips mix the flour well and add enough water to the flour to make a hard dough. Leave it covered for an hour. 3. Knead the dough and divide into 5-6 large balls. Roll out one ball into a large very thin circle (paper thin). Using a circular cutter, cut out smaller circles. Or you could make 25 small lemon sized balls and roll them out individually into thin circles/ pooris. I prefer them slightly thicker so I roll them out thicker and fry them a little longer. 4. Take filling with spoon and place 1 heaped tsp of the filling on one side of the circle. To secure the ends firmly, dip your forefinger in water and run it lightly on the inner part of the circle'e edge before folding it together. Press the ends together securely. I tend to make an overlapping pattern with the ends to make sure its sealed well. Then using a fork make a design to the edge. If the edge is not closed firmly, the filling may break open while frying and the contents of the filling spill into the oil, thereby creating a mess. Repeat the process till all the filling is used. Will make around 20 nevrios of medium size or 25 small nevrio's. Keep covered till they are fried. 5. Heat oil in a thick pan on medium to high heat. Fry two or three nevrios at a time till completely done and golden brown. Remove using a metal sieve spoon and placed over a cooling rack with kitchen paper to drain excess oil. Let the nevrio's cool completely before storing them in an airtight container. To avoid a soggy pastry covering- Ensure you add hot oil to the flour before making a dough. The flour should sizzle when adding the oil. Roll out each nevrio circle really thin and then fry the nevrio on medium to high heat till done/ golden brown. 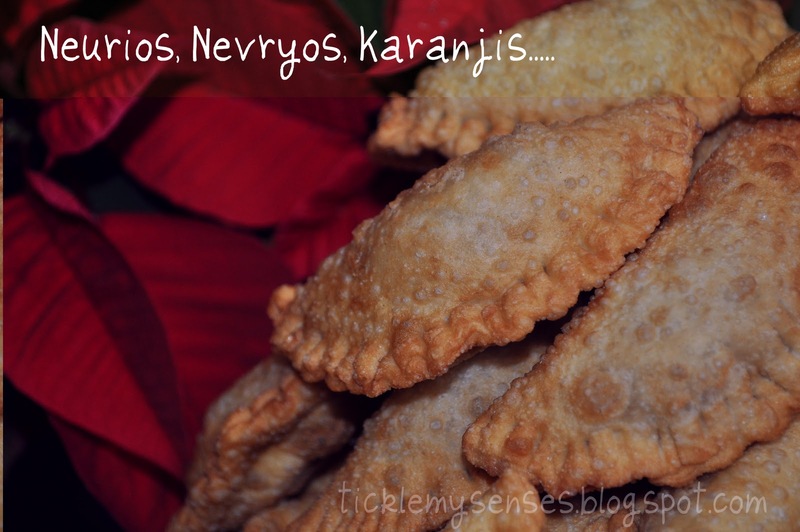 If your nevrio's turns out soggy :(....do not fret. 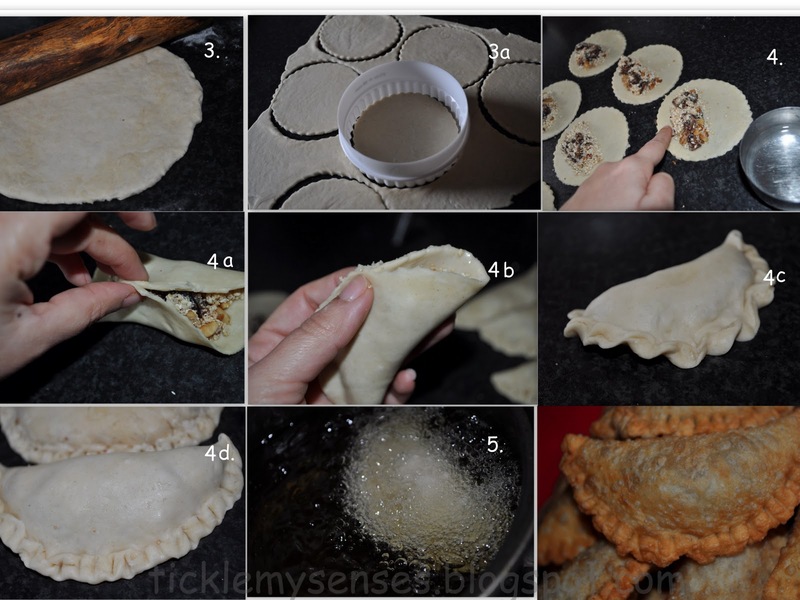 Place the nevrios on a baking sheet in a 175-180C/ 350F preheated oven for 7 -10 mins, they will be crispy again. Una receta ideal para estas navidades, me ha encantado!! I am excited and look forward to joining the radical dining club.....looks very interesting!! See you there shortly......till then Happy Cookng and Merry Christmas!! Very nice pastries. Had a difficult time trying to comment, glad I could finally tell you how much I like your blog.